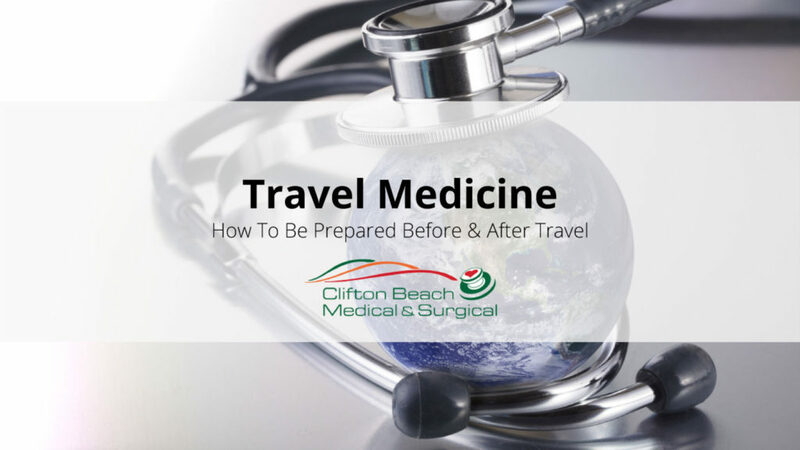 Dr Clare Applegarth from Clifton Beach Medical and Surgical takes a moment to discuss travel medicine. Hi, my name is Dr. Clare from Clifton Beach Medical and Surgical and today we’re going to talk about Travel Medicine. Now when you’re getting excited for a trip, thinking about going to your GP may not be the first thing on your mind but when you get sick when you’re away it can really ruin a trip. So, it’s worth thinking about some simple things to prevent becoming unwell when you’re away. Most of the time it’s important to get your vaccinations at least two weeks ahead of your trip. This is to make time for your antibodies to form in your body that will protect you against the infection. It’s also worth thinking about whether your childhood course of vaccinations is up-to-date, particularly before travelling to countries where polio and measles may be prevalent. Make sure your flu shot and your tetanus are up-to-date as well. If you’re travelling to parts of Southeast Asia, the Indian sub-continent, Central, South America, and Africa, it’s important to make sure you’re vaccinated against typhoid and hepatitis A because these both come from infected food and water. In the case of typhoid, the vaccination can provide you for protection for up to two to five years and comes as an oral or an injectable form. Hepatitis A vaccination will give you protection for one year but if you have a booster six months later you’re considered to have lifelong protection in most cases. In some parts of the world cholera comes as epidemics. The cholera vaccination can also provide protection against some other forms of traveler’s diarrhoea so it’s worth bringing your itinerary to speak with your doctor and see if this may be helpful for you to have. When you’re overseas, remember, always drink bottled water, or if this is unavailable bring water to the boil for one minute prior to consuming it and if you choose to have ice in your drinks make sure that this has been made from safe water. If you’re going to eat street food, make sure you make choices that are still hot and cooked in front of you rather than that which may have been laying around for some time. For raw fruit and vegetables be really careful, particularly with salads, as these may have been washed in contaminated water. If you’re going away for a longer period of time or if you’re travelling somewhere remote, such as going on a hike or doing aid work in a remote village, it may be worth speaking to your doctor about additional steps you can take to keep yourself safe. For example, if you’re travelling to Asia for longer than one month it’s sensible to have the Japanese encephalitis vaccination. If bottled water isn’t freely available where you’re going, it may be a good idea to take water purification tablets away with you. Also, talk to your doctor. If you’re staying somewhere very remote, it might be worth taking away a course of antibiotics to use in the dreadful circumstance of getting traveler’s diarrhoea. Rabies is a disease that’s prevalent overseas so if you get bitten by an animal it’s important that you seek timely medical care. Now, there is a vaccine that’s available for rabies, a course of three that you can have. But even if you’ve had this course of vaccinations, it’s still really important that within the first 24 hours of being bitten you seek medical care to prevent you from getting the infection. If you’re bitten, you may need to have a further course of injections just to make sure that you don’t catch the disease. The household mosquito brings a lot of disease throughout the tropical and equatorial parts of the world. Unfortunately, when you’re away there’s no safe time to go without mosquito protection because the Anopheles mosquito that spreads malaria feeds at dawn, dusk, and during the night. Whereas the Aedes aegypti mosquito that spreads diseases like Dengue or Zika can also feed during the day. To prevent a mosquito bite make sure that you always wear long pants and sleeves, preferably in a light colour, and also use insect repellent containing DEET or picaridin which can even be used in children. Make sure that your accommodation has got mosquito nets or screens. In the case of Zika, which is now known to be a sexually transmitted infection, it’s really important to use condoms and if you’re pregnant or planning to become pregnant, speak with your doctor first about your itinerary to make sure it’s safe to travel. Malaria is a mosquito borne infection that’s present throughout much of the world, including the Indian sub-continent, Southeast Asia, Central and South America, and Africa. It can make people really sick and can even be life threatening so it’s very important that if you’re going to a malarial zone to take tablets to prevent infection. There are a variety of different medications that you can take and it’s worth having a talk with your doctor about which types of medications are appropriate for the destination that you’re travelling to as well as what might be considerations for side effects, costs, and durations of therapy for malaria prophylaxis. The yellow fever vaccination is important to have if you’re travelling to South America or Africa. You may be required to show proof of vaccination when you’re coming back into Australia. Usually, one vaccination provides lifelong protection and Clifton Beach Medical and Surgical is one of the few clinics in Cairns that’s authorised to give this vaccination, so come and talk to us here about whether you may need it. Personal safety is really important when you’re travelling overseas. Studies show that when overseas we take risks that we would never take when we’re at home. If you’re planning to ride a motorbike, go scuba diving or engage in adventure activities take the same precautions you would take at home, wearing your helmet and checking that your equipment is safe. Also, remember that most travel insurance policies will not cover these activities in their general policy and you’ll need to purchase an additional travel policy if you plan on doing any adrenalin seeking activities. Finally, make sure that you register your trip with smarttraveler.gov.au so that if calamity strikes you’ve got some consular assistance to help you out. If you take regular medications, make sure that you have enough to last you for your whole trip. If that means that you’re going for longer than a month, your GP may be able to authorise for you to collect a few month’s supply at a time. It’s very important to take a letter with you explaining why you may be travelling with larger volumes of medications. If you’re taking strong painkillers or scheduled drugs, it’s very important that this doesn’t become an issue for you at customs. So, check with your doctor about what may be required to help you to travel safely with these drugs. Some people wonder, if they’re travelling last minute, whether it’s worth coming in to start the vaccination course at all. Usually, it’s worth getting started on the course even if that just means having your first one because it will usually start to provide some protection within one to two weeks. It’s always worth coming in and at least getting started on the course, even if you need to complete it after you’ve returned home. We always try to have vaccinations in stock but if you think you might be coming in for travel vaccines it’s always worth calling ahead to make sure that we have the ones that you think you may be requiring. This is particularly the case for children you may require special formulations of vaccines. A really good resource to consult is the CDC website, cdc.gov, which can provide some special advice for your destinations and what vaccines you might need. If you start to feel unwell when travelling home or even after being overseas, it’s really important that you speak with your doctor and tell them that you’ve been overseas. Diseases such as malaria can take even up to four weeks to start making you feel unwell. For public health, it’s very important that we diagnose these promptly and make sure that the diseases don’t spread in our local community. Just to recap, before you go overseas on holiday it’s always worth coming in talking to your doctor about your travel plans and any personal circumstances that you might need to consider. Remember, be safe with food and drink, always take precautions to avoid mosquito bites, register your travel with smarttravel.gov.au, and have a letter from your GP discussing your medications that you’re going to be travelling with, and have a great time. If you planning to travel overseas and would like to learn more about how to prepare, book an appointment today by calling one of our friendly reception staff on 0740591755 or click here.